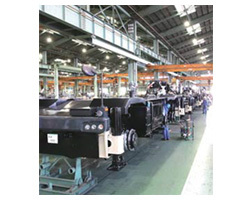 With our excellent design capabilities that respond flexibly to the needs of the days, a comprehensive production management system that speedily achieves high-quality craftsmanship, a solid support system that responds quickly and attentively to customers world wide, and additionally armed with a continually evolving integrated system ranging from development and design to manufacturing, sales and maintenance, we are further working at further building trust and cultivating new fields. While proactively adopting new features and new mechanisms, we undertake research and development and design of products with safety, environmental measures and energy conservation as our basic concepts. 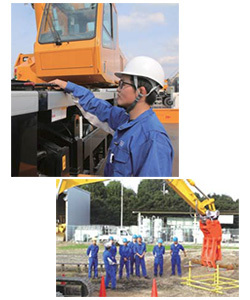 Additionally, this department is responsible for the drive control and safety devices of mobile cranes, development of software that controls the pumps on excavators, as well as performance and endurance testing of actual products. 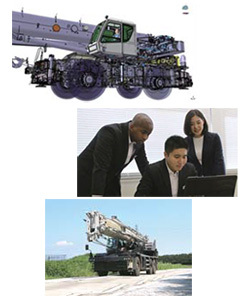 We conduct performance tests under stringent conditions on our variety of driving test courses for chassis and test grounds for hydraulic excavators. 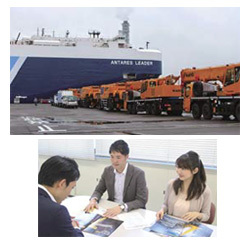 KATO sends staff to the domestic branches and sales branches across the country and overseas distributors are visited to provide training on operation and maintenance of the products. In addition, this department is responsible for collecting information in the field and providing technical training at service work shops. The staff and engineers in this department have many hands-on opportunities to come in contact with actual products, and as the technicians closest to our customers, they work to build further and deeper trust in relationships with the customers. Also by supplying genuine spare parts, we keep products condition for long life use. Based on our marketing policy of “putting the customer first”, we work close to customers and establish mutual relationship. 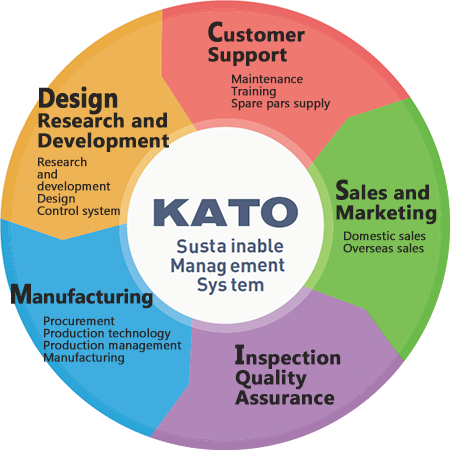 KATO products are sold to customers through the domestic sales branches and distributors in all over the world. Sales staff makes business trips to customers and also provides customer services to collect customer’s voice and market demand. We have established a thoroughgoing quality assurance system, ranging from pre-assembled parts to completed products, that uses various measuring instruments and equipments for inspection. 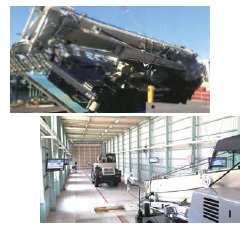 In particular, we have established an optimal test environment using the latest in non-destructive testing equipment to perform stringent checks on the main structures of our products. This department is responsible for all process management from procurement of materials, manufacturing of parts, assembly of products, and shipping based on a manufacturing schedule. Also, we focus on improving an manufacturing efficiency and productivity in factories that enables better development such as by improving line layouts and introducing new technologies.